SALT LAKE CITY (AP) Faith became the keyword in Quin Snyder’s postgame press conference. The Utah Jazz coach talked about his faith in rookie Donovan Mitchell, his faith in Ricky Rubio and his faith in his team. Mitchell scored a career-high 28 points and the Jazz beat the Portland Trail Blazers 112-103 in overtime Wednesday night. The game was tight throughout, with 17 lead changes and 14 ties – and neither team ever leading by double-digits. ”The game wasn’t real fluid for either team offensively early on,” Snyder said. ”We hung in there and didn’t get discouraged. As the game progressed, were much more aggressive. 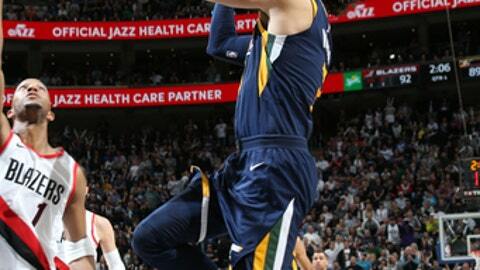 The Jazz ran their offense through Mitchell in overtime and he didn’t disappoint. The No. 12 overall pick accounted for the first six Utah points with a 3-pointer, a pair of free throws and Rudy Gobert’s two free throws that Mitchell set up with a pass to the cutting big man. Rubio, who finished with a season-high 30 points, buried a 3-pointer from the top of the arc with 30.9 seconds left in overtime to give the Jazz a seven-point lead and put the game away. The two Utah guards were fantastic down the stretch after the Jazz struggled on the offensive end. ”Each thing has to be better and a little bit sharper,” Blazers guard Damian Lillard said. ”We can take pressure off each other by screening a little bit better, throwing better passes on time and on target. Lillard put the Blazers on his shoulders in the fourth quarter, but was kept in relative check in overtime. The two-time All Star finished with 33 points, and Jusuf Nurkic had a season-high 19 points. The Blazers cleared out for Lillard on the final possession of regulation, but Gobert blocked his floater as time expired. Blazers: Portland entered the game ranked No. 6 in the league allowing 98.3 points per game. Stotts said that’s been the focus this season and their effectiveness has been more mental that schematic. … Portland shot a season-low 26.5 percent from 3-point range. Jazz: Rodney Hood was 0 for 11 two days after scoring a season-high 25 points. He was benched down the stretch. … Thabo Sefelosha scored a season-high 15 points. … The Jazz reserves outscored their Blazers counterparts 54-20. … Gobert finished with 16 points, 10 rebounds and three blocked shots. Lillard and Mitchell have become friends in the last year and text regularly. Lillard said he liked Mitchell’s game at Louisville and noticed that he wore Lillard’s Adidas signature shoe. He texted Mitchell congratulations after the draft and had hoped the rookie would slide to Portland in the draft. The two went head-to-head on numerous occasions throughout the night. Jazz forward Joe Johnson is out at least two weeks with right wrist instability. Jonas Jerebko, who had only played four minutes in the first seven games, checked in early in the first quarter and will see more time in the rotation. Trail Blazers: Host No. 2 pick Lonzo Ball and the Los Angeles Lakers on Thursday night. Jazz: Host Kyle Lowry and the Toronto Raptors on Friday night.